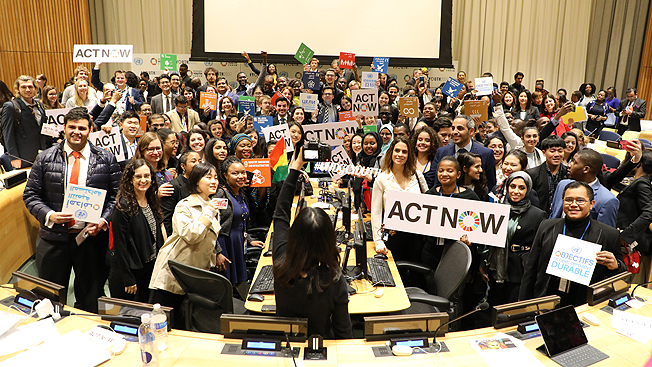 More than 1,000 young leaders and advocates at the United Nations today called on the global community to deliver on their promise of a future that is sustainable, safe and equitable. The youth leaders gathered at the two-day Economic and Social Council (ECOSOC) Youth Forum voiced alarm that 11 years before the 2030 deadline, progress on the Sustainable Development Goals (SDGs) remains slow, including on climate change – the greatest challenge of the world of today and tomorrow. “It is your future, your livelihoods, your freedom, your security, your environment. You do not, and you must not take no for an answer,” said UN Secretary-General António Guterres, calling on young people “to keep up the pressure” in the lead-up to the Climate and SDG Summits in September this year. The ECOSOC Youth Forum, co-hosted by the UN Department of Economic and Social Affairs and the Office of the UN Secretary-General’s Envoy on Youth, is the largest annual gathering of young people at the United Nations. This year’s Forum took place at a time when many young people are leading changes around the world, demanding that their leaders listen to their concerns, and deliver on the promises they made in 2015 when they adopted the SDGs. “Time and time again, youth have this burning fire, this resilient ability that no matter how many times we get pushed aside, overlooked, topped over, knocked down, we get back up every single time,” said Yolanda Joab from the Federated States of Micronesia, the keynote speaker at the Forum. “Every day around the world, young people are teaching, creating, rallying, innovating, building, sailing, marching, questioning and dreaming because we believe in better,” added Ms. Joab, a climate activist and the Founder of Island PRIDE, an initiative that empowers communities in Micronesia to tackle climate change. This year’s Forum, the first since the launch of a UN youth strategy last year, focused on the theme, Empowered, Included and Equal – very much in line with the strategy which seeks to strengthen the efforts of the UN System and stakeholders to place young people at the front and centre of the global development agenda. Today, there are 1.2 billion young people, between the ages of 15 and 24, making up 16 per cent of the global population. Most live in developing countries. Millions do not have access to quality education, decent work or other opportunities. By 2030, 1.9 billion young people are projected to turn 15, and will need skills, jobs and livelihoods to realize their full potential and lead meaningful lives. Speaking at the side-lines of the Forum, youth participants at the SDG Media Zone discussed an array of issues of concern as well as innovative solutions to major challenges, including youth empowerment and leadership, sustainable consumption and production, the future of work and the need to act now for a more sustainable and healthier future. “Africa is the youngest region in the world,” said Madelle Kangha, one of the 17 Young Leaders for the SDGs and the Founder of JumpStart Academy Africa – which aims to transform the education system across the continent, by providing leadership and entrepreneurship training to students. “Sixty per cent of its population is under the age of 25 and by 2030, we are going to have a working age population of about 600 million,” she added, stressing that much more needs to be done in policy-making and reform to meet the needs of the growing population. In her call to action, she urged for more inclusive dialogue between governments and young people from all walks of life, including those living with disabilities and in rural communities.